When you Normal Summon or Flip Summon this card, you can Special Summon any number of "Skyblaster Tokens" (Fiend/DARK/Level 4/ATK 500/DEF 500) but not more than the number of monsters you control. Dur.. This card cannot be Special Summoned or Set. This card can only be Special Summoned from your hand to your opponent's side of the field by also Special Summoning 2 "Grinder Tokens" (Fiend-Type/DARK/Le.. Send 4 ''Crystal Beast'' cards from your Spell & Trap Card Zone to the Graveyard. Send all cards on the field to the Graveyard. Then, Special Summon as many ''Crystal Beast'' monsters as possible from.. This card gets these effects, based on the number of "Crystal Beast" monsters in your Spell & Trap Card Zone. 1+: This card cannot be destroyed by a card effect. 2+: Once per turn, you can halve the B..
Equip only to a "Crystal Beast" monster. It gains 800 ATK. When this card is sent from the field to the Graveyard, you can place 1 "Crystal Beast" monster from your Deck in your Spell & Trap Card Zone..
Each time a "Crystal Beast" monster(s) is placed in either player's Spell & Trap Card Zone, place 1 Crystal Counter on this card. You can send this card to the Graveyard to take a number of "Crystal B..
Activate only when your opponent's monster declares an attack. You can select 1 ''Ancient City - Rainbos Ruins'' from your Deck and activate it. If your opponent had an active Field Spell Card when th.. Send all cards in your Spell & Trap Card Zone to the Graveyard. Place as many "Crystal Beast" monsters as possible from your Graveyard in your Spell & Trap Card Zone, face-up, as Continuous Spell & Tr..
Activate only when a "Crystal Beast" monster you control is destroyed by battle and sent to the Graveyard. 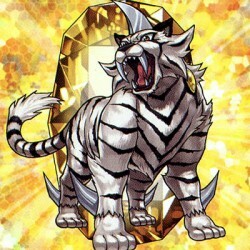 Place 1 "Crystal Beast" monster from your Deck in your Spell & Trap Card Zone, face-up, as a ..